Manuscript: A-61(4) with dedication A Mad me Alida Lütkemann on the title page, and dated on the last page gecomp. Octob. 1898. 2-9 Nov. 1907 geïnstr. 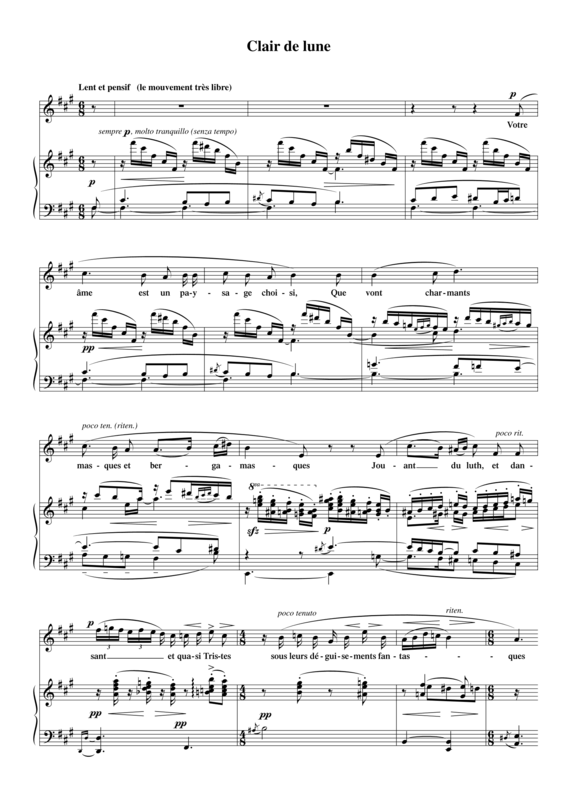 Diepenbrock composed Clair de lune (Moonshine, RC 43) in September 1898, inspired by Fauré’s beautiful setting and the suggestive power of the poem. In November 1907 he orchestrated this song, which was for a time the last in a series of works on texts by his favourite poets Verlaine and Baudelaire. Compared to the orchestral versions of Recueillement (Contemplation, RC 79/80), Les chats (The Cats, RC 68/81) and Écoutez la chanson bien douce (Hear the Sweetest Song, RC 40/82), Diepenbrock used considerably more woodwinds in Clair de lune, including a third flute (also piccolo), two clarinets and a bass clarinet and not only an oboe, but also an oboe d’amore and an English horn. For the melody of the opening measures Diepenbrock combined the oboe with the English horn and the bass clarinet (both playing an octave lower), thus creating a melancholic blend of timbres right from the start. Like in the other songs on texts by Verlaine and Baudelaire, the string ensemble does not include any double basses. The orchestrated version of this song was not performed during Diepenbrock’s lifetime. Hidden beneath their fanciful disguise. Slender jet-fountains – sob their ecstasies. A-61(4) with dedication A Madme Alida Lütkemann on the title page, and dated on the last page gecomp. Octob. 1898. 2-9 Nov. 1907 geïnstr.